In case you don't already know, Ori and the Blind Forest is a wonderful game. It's an atmospheric metroidvania set in a beautiful world with well-crafted environments, an interesting moveset, and an emotional yet wordless story... and it was our 2016 Game of the Year. 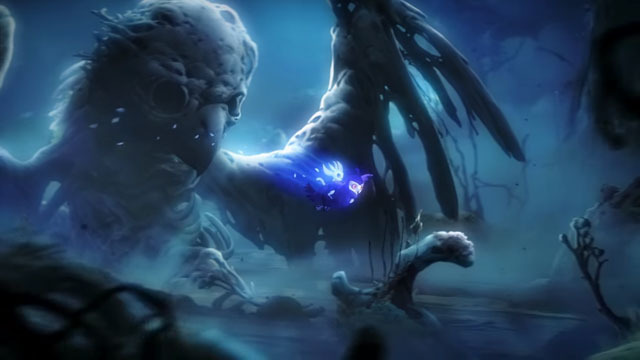 Microsoft and Moon Studios (game site) have returned with a sequel entitled Ori and the Will of the Wisps, which is once again set in a lush and beautiful world filled with amazing creatures, with an adventure-platformer setting where the player explores an open world and gains new abilities to reach new areas. The game stars Ori, this time on a quest to assist a young owl who comes from a tribe of owls that have been wiped out, presumably related to the villainous owl, Kuro, from the original game. This time around, Ori is able to access spells to combat his enemies, and wield melee- and projectile-based weapons, putting a heavier focus on combat over the more platforming-focused original... although there are some new environmental navigation abilities as well. The game is coming to PC and Xbox One in 2019.